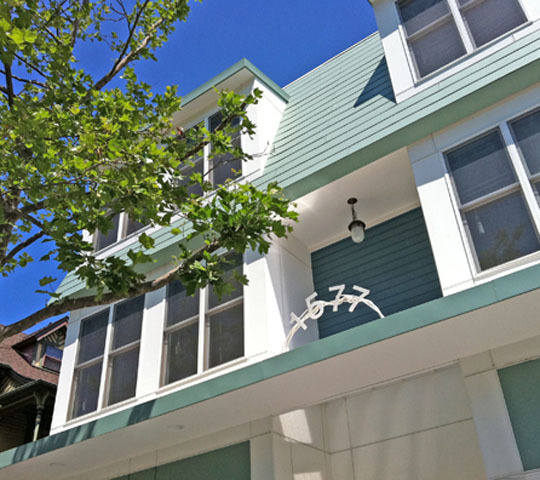 1577 Westminster Street is sustainable not only for its conservation of resources, but for the way it embodies a holistic approach to development. It adds community participation, a healthy food chain, social equity, affordability, and sensitive urban form-making to technical and siting concerns. Westminster Street on Providence’s West Side was once lined with elegant large mansions, but by the mid-1980’s, many had disappeared and replaced with ugly single-story automotive buildings or abandoned lots. 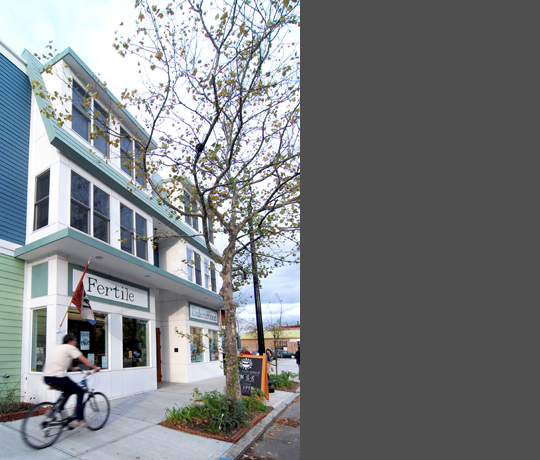 Replacing one of those lots, this new construction urban infill mixed-use project has become a vibrant symbol of positive community action and reflects the historic neighborhood’s caring and off-beat spirit. The West Broadway Neighborhood Association (WBNA) decided to set an example for responsible, sustainable development that enhanced the neighborhood. 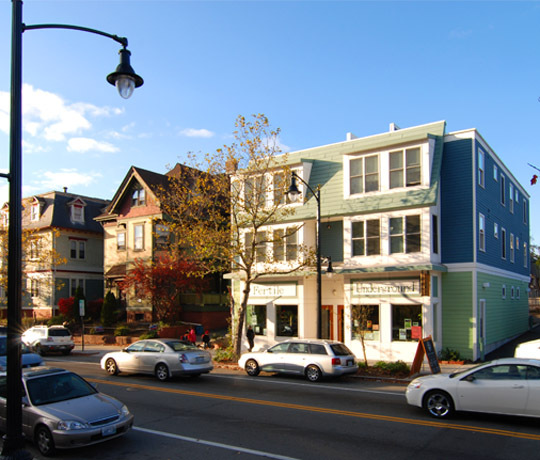 They created a neighbor-juried design competition for their first new construction development which the architects won by popular vote in 2004. Over the next 8 years, numerous financial and logistical setbacks were overcome through a combination of willpower, dedication, and vision by the entire project team and community supporters. The architects were responsible for design of the building and site, planning and implementing green measures, as well as intensive coordination with engineers, funders, community groups, regulators, contractors, artisans, and volunteers. 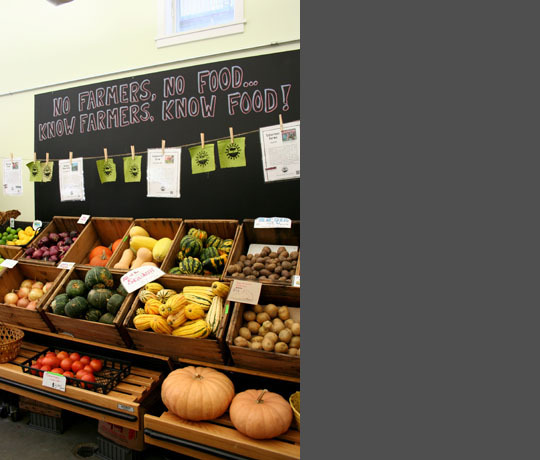 The ground floor was created as a retail incubator grocery space for healthy, local food to address the “food desert” on the West Side. 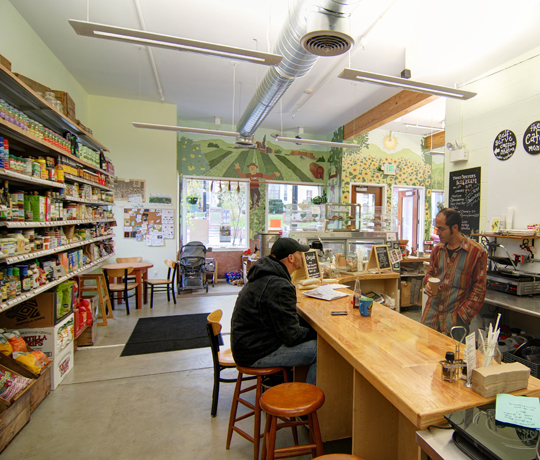 The resulting Fertile Underground has become a popular neighborhood hub, providing not only fresh produce but organic staples, a deli, and events. WBNA partnered with Spurwink RI, who provides housing for adults with developmental disabilities, to create seven one-bedroom apartments upstairs with a common room. They recognized a unique opportunity to engage their residents with the community. The design takes its cues from its Victorian neighbors on massing, height, and scale, yet re-interprets a traditional mansard form with modern moves and detailing. A driving factor for the design was the project’s demonstration of the newly created West Side Overlay District, which the WBNA had helped write. The shoestring budget meant that resourcefulness was the determining factor to all decisions, so the design team developed a custom “Green Plan” in absence of funding for third party certification. The Green Plan kept a running prioritized list during design to keep resources focused on getting the most ‘bang for the buck’, and took full advantage of nearly free strategies from south-facing windows with deep overhangs and a natural ventilation shaft, to an old-fashioned drywell to mitigate stormwater. Strategies such as high-performance insulation and a 95% AFUE boiler paid off when the project was tested with a Energy StarHomes HERS Index of 60, which means it uses 40% less energy than a home built even to today’s stringent energy codes.